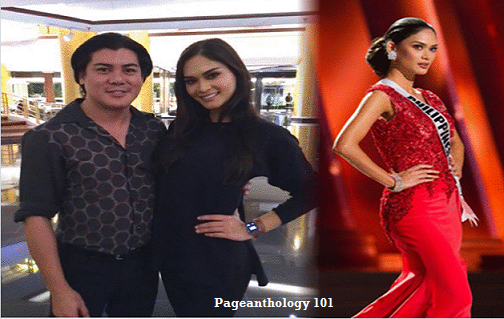 Pia Wurtzbach has finally met the designer of her red gown she wore during preliminary competition of the Miss Universe 2015. Pia had invited the California-based designer Oliver Tolentino over for dinner last night, February 9. Oliver took to instagram to share a photo with Pia Wurtzbach and captioned : "Nice to finally meet in person, @piawurtzbach Thank you for dinner last night, and I wish you all the best in your post Miss Universe journey!" Oliver was skiing down a mountain in Aspen, Colorado, last December when he felt his cell phone vibrate through his heavy jacket. Someone in Las Vegas, in a panic, was on the line asking for Oliver’s help; it was an emergency. “I was on vacation when the call came in,” Oliver said. “They kept telling me that Pia didn’t have a proper gown for the following day. After my initial shock and confusion—how could this be happening the day before the preliminaries?—I agreed to do whatever I could to help our candidate. “I called my Beverly Hills boutique and had them prepare nine gowns. I even included two cocktail dresses in case there was any other event Pia might not have a dress for,” said Oliver. “I also wanted to provide as many choices as possible because I knew there would be very little time for a fitting and I wasn’t going to be there, so I chose gowns over the phone quickly, from memory. “Pia wasn’t going to get the gowns until that evening, and I knew how important it was to get the gown issue behind her so she could be well rested the night before the pageant,” Oliver noted. Oliver said that Pia’s team initially had picked out the gowns from his website that they felt would suit her, but those gowns had already been sold. Pia’s side requested blue gowns. Oliver sent some but decided to include the red gown—the one he felt would work best. The red gown was the second Pia tried on, and it fit perfectly. The cut and design did not overwhelm her face and figure, a must in any evening gown segment. Pia reportedly didn’t want to take it off and immediately practiced walking in it in the hotel lobby. There has been much debate over who wanted Pia to wear which gown but, ultimately, the decision was Pia’s. Sources say she wanted, and felt most comfortable in, the red Oliver Tolentino gown. As they say, the rest is history. Pia was the only one in red in the preliminary grouping and advanced among the top contenders for the title, eventually winning one of the most memorable Miss Universe pageants ever. Oliver became the first Filipino designer in years to have his gown worn in a Miss Universe pageant by the Philippine bet. At last, they have finally met in person. Again, Thank you Sir Oliver!